While testing wild strains of yeast containing prions, researchers at MIT discovered that prions awaken dormant stretches of genes that can help the yeast survive environmental stresses and that those new traits can be passed on to offspring, contributing to evolution in an unexpected way. Misfolded proteins called prions are best known for causing neurodegenerative disorders such as Creutzfeldt-Jakob disease and mad cow disease. However, a new study by scientists at MIT’s Whitehead Institute finds that they can also play a much more beneficial role. The research team, led by Susan Lindquist, has shown that in yeast, prions awaken dormant stretches of genes that can help the yeast survive environmental stresses. Furthermore, those new traits can be passed on to offspring, contributing to evolution in an unexpected way. Lindquist, a professor of biology at MIT, first proposed this evolutionary mechanism more than a decade ago, but many scientists resisted the idea because no one could find evidence that prions existed in “wild” strains of yeast, as opposed to the laboratory strains used for genetic studies. In a new paper published in the Feb. 15 online edition of Nature, the researchers tested nearly 700 wild yeast strains and found prions in a third of them. “Now we have evidence that these elements exist in nature and can influence adaptation to a variety of stresses that are relevant to the survival of the organism,” says Dan Jarosz, a postdoc in Lindquist’s lab and one of the paper’s lead authors. The other lead author is Randal Halfmann PhD ’10, now at the University of Texas Southwestern Medical Center. Prions are abnormal conformations of proteins normally found in cells; the misfolded versions can have striking effects. Previous studies in laboratory strains of yeast have shown that a prion called PSI+ can form clumps that interfere with a cell’s ability to read its own genetic information. Normally, DNA’s instructions are copied into a molecule known as messenger RNA (mRNA), which is then read by ribosomes, where proteins are assembled. The PSI+ prion prevents the ribosome from stopping in the right place, so it continues adding to the protein, potentially generating a novel trait. Under normal circumstances, prions appear in only about one in a million yeast cells. Their presence acts as a bet-hedging mechanism for the population: If the prion adaptation turns out to be unfit for survival, the population loses very few cells. Interestingly, when the environment becomes stressful, prions start appearing at a higher rate. “When things are not going well, the cells increase the frequency at which they take that bet,” Lindquist says. In this study, the researchers found evidence of PSI+ in 10 wild strains; another well-known prion, MOT3+, was found in six wild strains. To test for unknown prion elements, they exposed the strains to a chemical that switches PSI+ and MOT3+ out of their prion states, and found that 255 strains demonstrated novel traits after this treatment. Approximately 40 percent of those traits proved to be beneficial to growth in a dozen different environmental conditions tested, including acidic environments or in the presence of antifungal drugs or high levels of ethanol. The prion-induced traits can be passed on to future generations, initially through inheritance of the prions themselves, and subsequently through genetic mutations. That is, the trait can become encoded in the genome if a mutation occurs that causes the gene to be read beyond the normal stopping point. 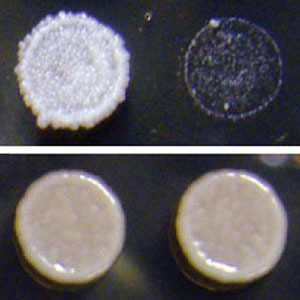 The new paper represents a “huge step forward” for understanding prions’ role in yeast evolution, says Yury Chernoff, a professor of nanobiology at the Georgia Institute of Technology. “Now you will be able to convince people that you can’t ignore prions any longer when you’re talking about evolutionary concepts,” says Chernoff, who was not part of the research team. The MIT researchers are now working with scientists at the University of California at San Francisco to determine exactly how the prions they identified in this study give rise to the new traits they observed in yeast. They are also looking for evidence that prions have similar effects in other organisms. Be the first to comment on "Researchers Discover that Prions Play Role in Yeast Survival and Evolution"